More than just workout shirts. 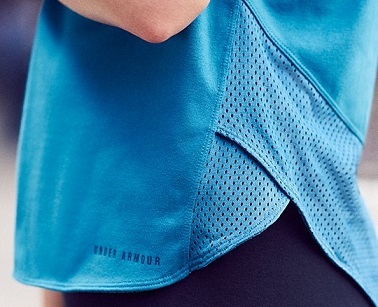 Women's short sleeve moisture wicking athletic shirts might be the way to go. However, it depends on the workout you have in mind. When selecting an athletic top, pay careful consideration to the activity that is planned. A tank top may be good for you hot yoga class, but we would not suggest it if you are mountain climbing during winter in Alaska. A shirt is a cloth garment for the upper body typically worn from the neck to the waist (obviously worn to different lengths). Athletic shirts are tops that are mainly worn for the purpose of sport or exercise. Technically, athletics is a collection of sporting events that involve competitive running, jumping, throwing, and walking. However, athletic shirts can be worn for many different types of sports or fitness activity. Common athletic shirts include t-shirts, tank tops, compression shirts, sports bras, sweatshirts, etc. An athlete or sportswoman is a person who is good at a sport and competes in one or more sports that involve physical strength, speed or endurance. Wearing the proper top during such activities is hugely important. Sweatshirt are long-sleeved athletic shirts of heavier material. They are available with or without hoods. An outdoor enthusiast is a person who enjoys sports and activities in nature and wilderness areas. Interests associated with outdoor enthusiasts include hiking, fishing, hunting, cross-country skiing, snowshoeing, canoeing, climbing and camping. Woman who participate in outdoor activities such as ice fishing, may require a different athletic top than a women would wear doing track and field. Comfort, warmth, and other issues should be taken into account prior to purchasing clothing. You may want to visit the following pages as well. It is always a good time to learn more about athletic clothing for women.